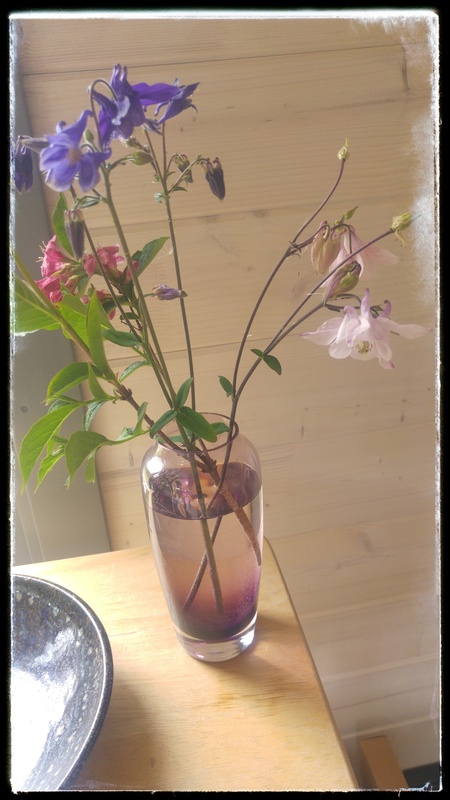 Lavender Moon Girl's Tales from Brown Hare Cottage – Ramblings about turning an old nineteenth century cottage into a home. I love the Cynara structural plant, looming like a giant thistle. I can see so many shapes and textures. Back in the Studio, I began playing with oil pastels, water and made marks with sticks and sponges. Sometimes it can be a simple moment in the garden which gives inspiration. I’m glad it’s cooler now so that I can pop in and out of the Studio, however there’s never enough time! Pop over to my other Lavendermoon site for more pictures and poetry. Yesterday I attended a painting workshop. We used acrylics and designed our Painting and styled our palette on the Artist Kandinsky’s works. I was totally out of my comfort zone using bright colours however Kandinsky’s interest in spiritual and evoking mystery and atmosphere inspired me to paint this canvas, untitled at the moment! Silky Buttercups bob about grinning! Where a tiny sprinkling of piercing blue periwinkles blink faraway in the memory of dew. A rainy spring afternoon is ideal for searching through your store cupboards for baking ingredients. I found freeze dried Raspberries and ground almonds and decided to concoct a recipe for teatime. I’ve now had a couple of small slices; the cake is moist, tasty and light. Sift dry ingredients except sugar into a large bowl. Cream spread with sugar, add egg, milk and vanilla extract. Fold in the flour mix. Fold in gently the raspberries. Cook for 40 mins but check after 35. Use a metal skewer to check the cake is cooked through. The skewer should come out clean if it is ready. Cool completely before lifting out of the tin. Enjoy with a cup of Earl Grey or Afternoon Tea blend. In the Studio I have been snatching sleepy. 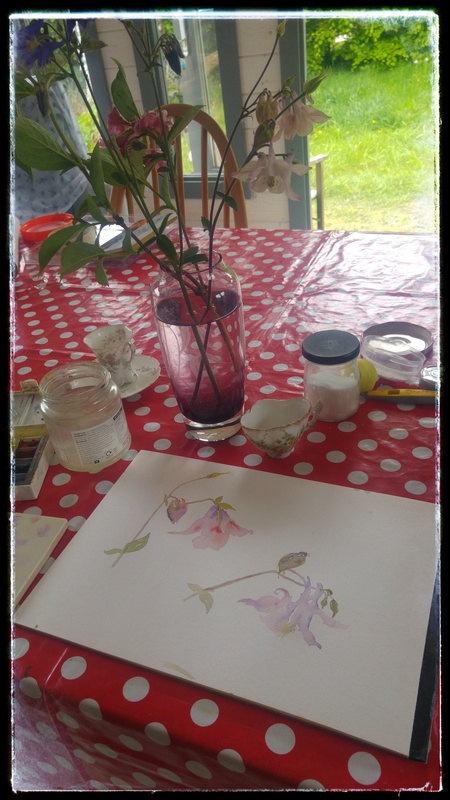 Sunday afternoons to play with watercolours, dreaming of bluebell woods and spring flowers. These paintings are work in progress, hopefully I’ll finish them soon. How have you been spending sleepy Sundays? It’s hard to feel inspired when the wind is bitter and there are snow blizzards, however this morning the sunshine warmed the Studio: it smelled of a welcoming wood so I decided to have a play. Fox in a wintry wood. 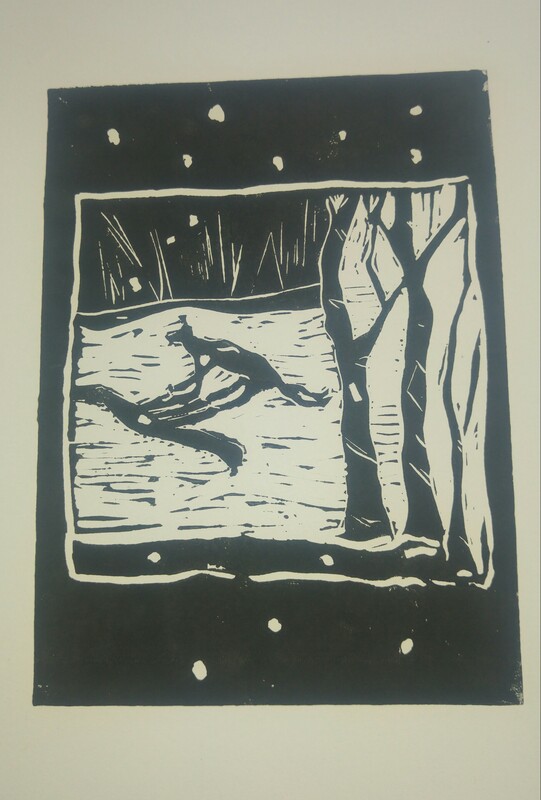 This linocut print was the result of a workshop I did last weekend. Sometimes it is good to work alongside other artists. It was inspired by a lovely experience in Cople wood, or I like to call it the magic, or fairy wood. The little wood does have a magical atmosphere. One day we were out walking when we saw this young fox peering at us. It was a special moment I always wanted to recreate the image in my head. I hope you enjoy it. I may make a smaller version for cards. 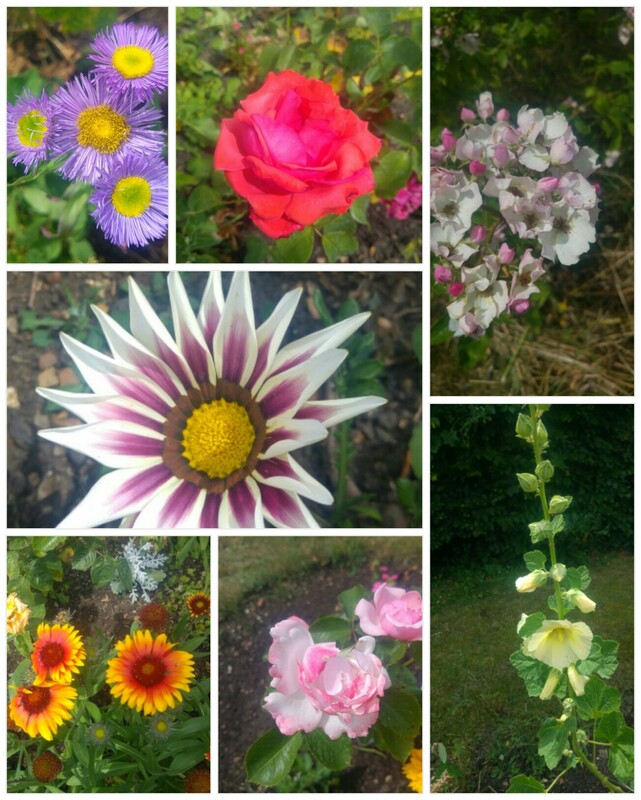 Mid summer here we come with an abundance of flowers in the garden to enjoy. I particularly love scented roses in delicate pinks or hot orange and yellow calendulas and zinnias. Yarrow which is beautifully structural has replaced the poppies and dahlias are very cheerfu! We’ve just had an unbelievably hot week, or more. Everyday I have been up early watering the garden and greenhouse before taking the dogs for their walk. I am really enjoying the garden now as it is a joy to see plants I’ve grown from seed flourish and last year’s plants particularly Dahlias appear. I love the variety of colour and textures in the garden. The oriental poppies as have wild poppies been spectacular, I love watching their delicate papery petals dancing in the breeze. When they are backlit by the sun in late afternoon they look stunning. This year we decided to buy garden furniture so we can sit with a cup of tea or a meal, watching the visiting birds swooping about, landing on a hoe or garden fork, they can be comical. Goldfinches are beautiful birds. 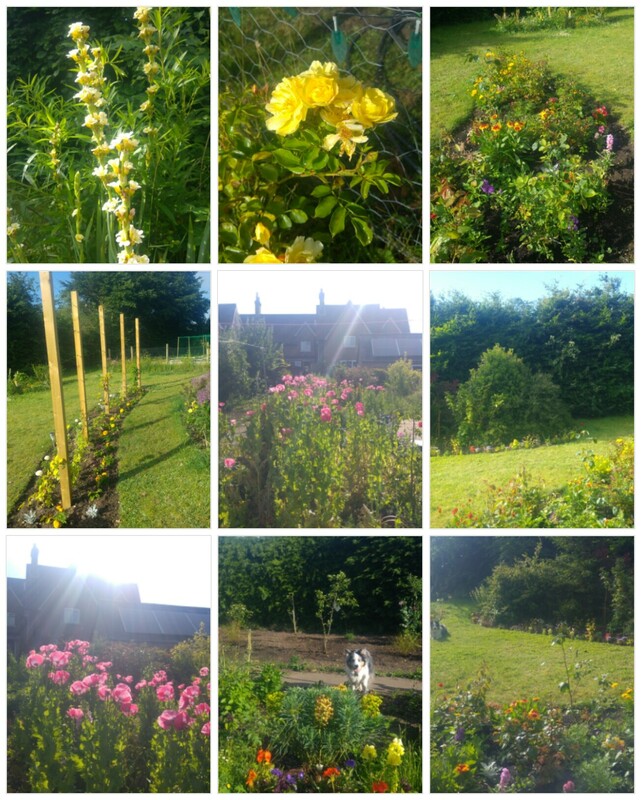 We are proud of our garden, it has a long way to go but it is like an artist’s canvas turning into nature’s theatre. You can’t beat it! Art studio up and running! 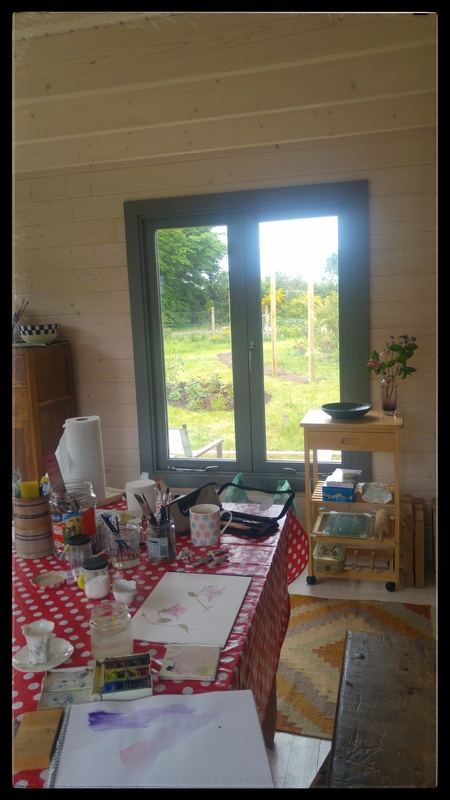 Gradually I am moving my artist materials and equipment into the log cabin art studio, which is situated about half way down our large garden. We purchased most of the vintage furniture from our local auction as I wanted a homely, eclectic feel to my studio. 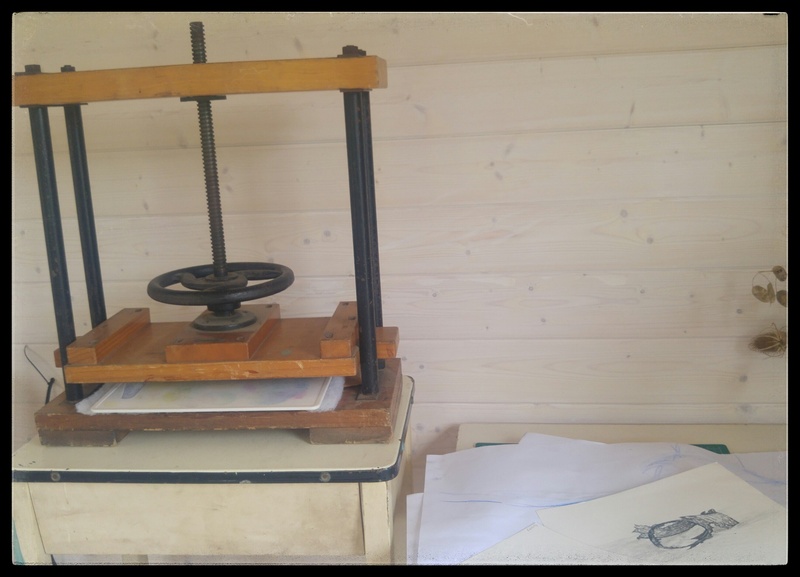 My husband bought me the printing press from an antique shop in Ampthill called the Emporium, for Christmas. I have basic heating and lighting and when our home extension is built I will have everything I need. I am really enjoying having my own space. I pop down when I like, make a cup of tea, ponder my art books, sketch, write in my studio diary or just watch the birds on the feeders, the sun going down, cloud formations, bees on the flowers or listening to the rustling of leaves, or the cockeral next door. It is just so magical! 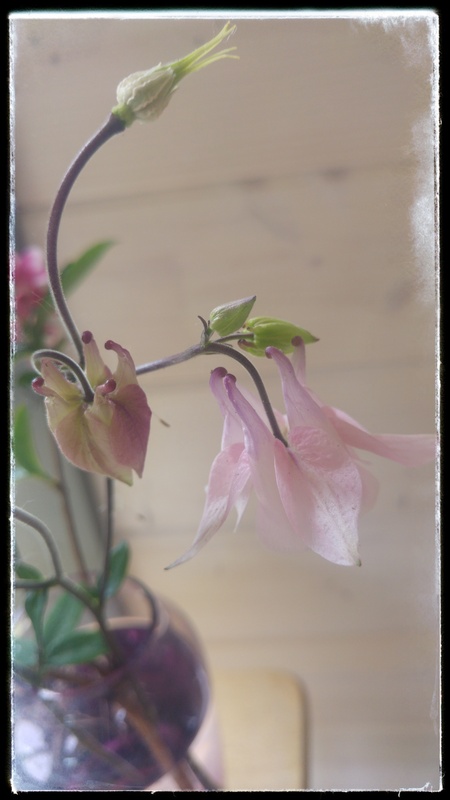 The Aquilegia or Columbine Is a beautiful fairylike plant which just loves growing in our garden. I love its delicate petals and the colours are faded and old fashioned. 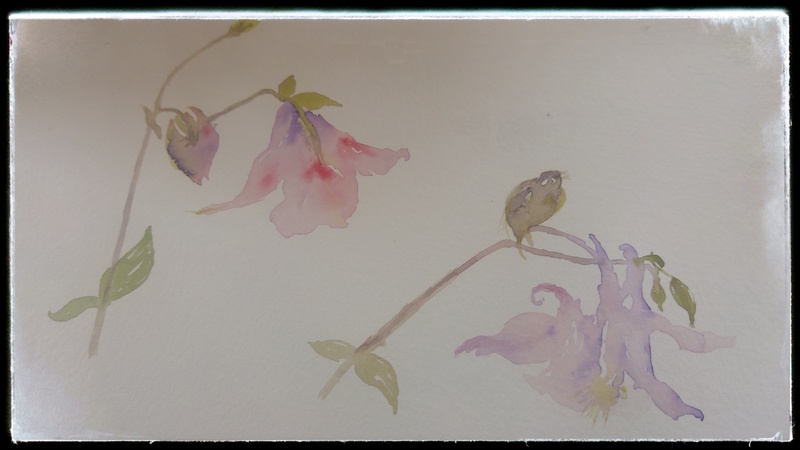 I decided to pick a few blooms for the studio to do loose watercolour painting cameos, which I will add glazes to later on, or I may just leave them looking fresh and delicate. The colours haven’t photographed well, however hopefully you’ll get the essence!